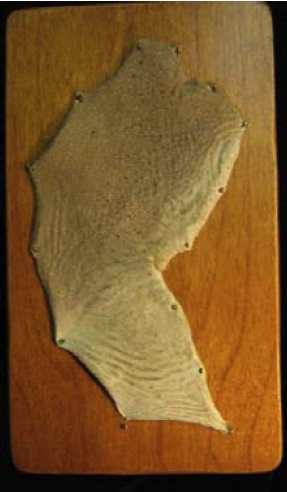 Just the biofacts: What is sandtiger shark skin made of? When you visit The Trust Family Foundation Shark and Ray Touch Tank, you probably will have only a few seconds to touch a shark before it swims past you. But find one of our educators in the exhibit, and you could have a chance to spend a lot more time with some shark skin. One of the biofacts that educators bring into the touch tank exhibit is a piece of sand tiger shark skin (shown at left). 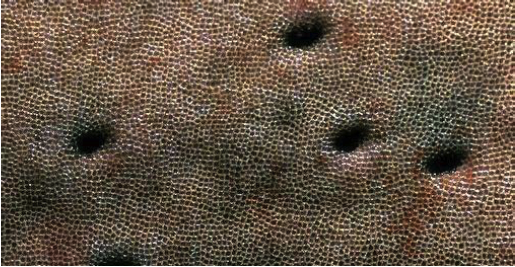 When you get up close to the skin, you can see that it has tiny scales called dermal denticles (“tiny skin teeth”). Dermal denticles point tailward, so when you feel shark skin from head to tail, it feels smooth, but from tail to head, it feels coarse like sandpaper. The denticles are also strong, giving the shark a flexible, armor-like skin. This helps reduce drag and allows the shark to move more quickly through the water. If you take a closer look at the skin, you may find something else amazing. Look for small holes or pores—those are the Ampullae of Lorenzini. Located around the snout and under the mouth of a shark, these special organs can sense the electrical fields in the water, giving sharks their “sixth sense”! They help the shark find food and may assist in locating birthing grounds. Sand tiger sharks are listed as Vulnerable to Extinction due to capture for sport and by commercial fisheries. Many types of sharks have been hunted for their skin, which some cultures use as sandpaper or to make purses, wallets and shoes. They are also caught as bycatch in nets of other fisheries. We can reduce the number of sharks caught by not purchasing shark-related items and by choosing seafood that’s caught in a sustainable way, reducing shark bycatch. Visitors can check our website for additional information on sustainable seafood choices.